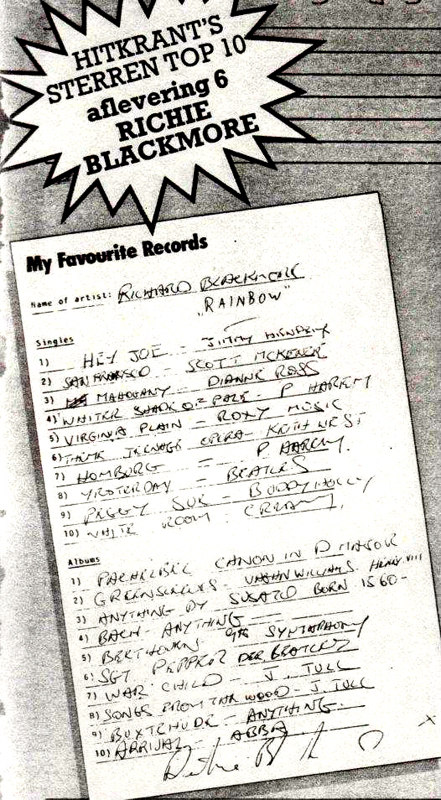 From a Dutch music magazine back in 1984 (Hitkrant) comes an interesting Top Ten Records chart, filled in this particular month by Richard Blackmore. As Richie explained to the journalist, he liked to relax by listening mostly to classical music, so the album section is geared toward that. Just two Jethro Tull albums in amongst them, not the ones you would first think of either, plus a mention of Abba. The singles are where his popular music tastes show. Two by Procul Harum, a long standing favourite band (some will recall their music being played in the intro tape to early Deep Purple reunion shows), but a liking for Roxy Music and Diana Ross tracks was new to me. I don’t know the Ross single, but very little to argue with in the rest of the list (thought the strange spelling of Jimi Hendrix does jump out). And if only we’d known he was into Keith West’s Teenage Opera, we could have sent him a copy when we did the first CD reissue of this back in RPM days. Thanks to Tonny Steenhagen for the insight. Do you mean the Adam Faith session Tommy? I of course remember HITKRANT, being a Dutchie too! I do recall a certain issue of HITKRANT where Blackmore’s writing was analysed as well. I must have it somewhere. I think we have the hand-writing issue as well Mark! Curiously Ann is a bit of a hand-writing expert and tried the same piece but came to a very different conclusion! Oh come on Simon, even you have heard “Do You Know Where You’re Going To” by Diana Ross!!!! Must confess Barry that post-Supremes my Diana Ross listening did rather tail off.